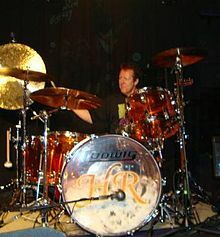 Herman Rarebell (born 18 November 1949 as Hermann Josef Erbel) is a German musician, best known as the drummer for the band Scorpions from 1977 to 1995, during which time he played on eight studio albums. Aside from playing drums, Rarebell wrote or co-wrote several songs for the group such as "Another Piece of Meat", "Falling in Love" and "Passion Rules the Game". He composed the lyrics for some of the band's most well known songs such as "Rock You Like a Hurricane", "Make It Real", "Dynamite", "Blackout", "Arizona", "Bad Boys Running Wild", "Don't Stop at the Top", and "Tease Me Please Me". Rarebell has been a long-time user of Ludwig drums and Paiste cymbals, which he used for his entire duration with Scorpions, though he would occasionally alter the amount of drums and cymbals he would have on his setup. Rarebell also occasionally used cymbals from Paiste's 3000 series as well upon their release in 1986, but would still usually stick to a mostly 2002 series setup. ^ "Rs Rindfleisch Original Handsignierte Autogramme/autogrammkarte ( Rar ) • EUR 33,16". PicClick DE (in German). Retrieved 2019-04-05. ^ "RS Rindfleisch". Discogs. Retrieved 2019-04-05. ^ "Missus Beastly (2)". Discogs. Retrieved 2019-04-05. ^ "Herman Rarebell "Top of the Rock" (single) Sweet Sounds/Interscope, Produced by Duke Jackson". Sweetsounds.us. Archived from the original on 2011-11-02. Retrieved 2011-10-25.